All I knew of sound bath therapy was a quick Google search. I walked into Maha Rose's candlelit room feeling heavy. Not physically speaking, though, as I was more so feeling weighted down by worry. I needed to release something, although I wasn't exactly sure what it was just yet. With no idea what to expect, I found an empty blanket and pillow, which were all lined up together and sat down barefoot and antsy. I looked to my left and right, and my neighbors looked so grounded. A sense of calmness took over the room. The two leaders of the sound bath started by telling us to rub our hands together until they got warm. Then we began a tapping technique to unlock our chakras. My nerves began to calm down, and I started taking my mind, which was wandering elsewhere, to the present moment. To warm up, we did a particular "cleaning" and "showering" method where we used our hands to wash our bodies. No water was involved, simply movement. It was like ridding our minds and spirits from what we walked in with, which was something I appreciated, as I walked in bearing more than I was able to handle. After repeating a few more motions to start aligning us into a relaxed state, we were told to lie down on our blankets. This is when the true magic happened. I closed my eyes, and the sounds took me to another place. They weren't normal sounds, though. They were sounds that shifted my mind into a relaxed, trance-like state using instruments and rhythms that made me lose track of time. I honestly can't tell you what I was thinking of during the two-hour sound bath. The noises and relaxed scents truly made me forget about everything and focus on none other than myself in that present moment. I reached a meditative state of euphoric peace, one that I'd never experienced before. If I'm being completely honest, I dreaded coming here. I was nervous I wouldn't fit in and that I wouldn't reap the benefits of the class because I wouldn't be able to calm down my thoughts. This experience was transformative, and for the first time ever, I actually felt like I was able to let go of outside influences and noises of the world and truly go inward. "As humans living in this modern age and especially those of us that live in New York city our minds and are nervous systems are bombarded most of the time," explains Lisa Levine, acupuncturist, reiki master, and founder of Maha Rose. "Our minds are agitated. Spiritual practices such as yoga and meditation help but if we are very out of balance we may need something stronger to help reset the nervous system and bring us to a state of relaxation. Sound baths can do this. Then we can maintain our equilibrium by subtler daily practices: yoga and meditation." 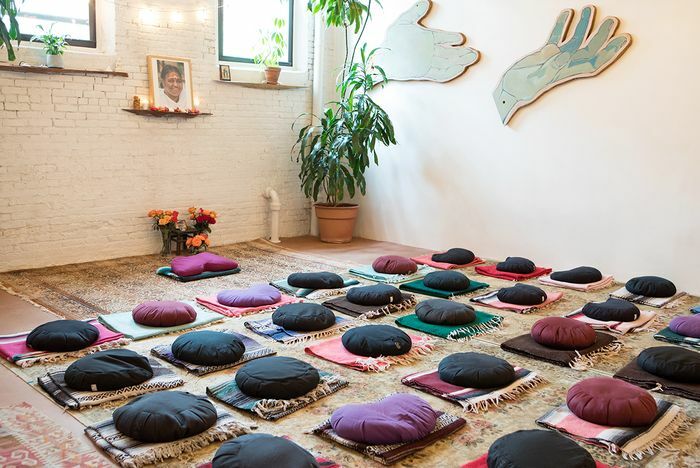 Levine continues: "The sound waves felt during a sound bath are able to comb out the energetic bodies; all the kinks and bends and bits of funk that we collect throughout the day, are smoothed out helping us to connect with our more peaceful centers. I think often people try to meditate and they cannot, or think they cannot because their mind does not hold still for just one second. Once we have an experience of peace in our minds and bodies then we know it is possible and it becomes more possible through gentler approaches. Not that sound baths aren’t gentle. They can be, but they are also very much about receiving, laying down and just receiving, which in our active lives is an incredibly beneficial experience." Jarrod Mayer, who is the certified sonotherapist who led my experience touches on the benefits of each sound. "These are all typically tools we use in our wake up sequence," Mayer explains. "For the feathers we used Turkey, these represent abundance and prosperity. The feathers also brings in the air element and allows people to feel their body again before actually moving it. On a spiritual healing level it has the ability to release the memory of trauma. Being it’s the air element, which is associated with the lungs, people begin to breathe consciously when they feel the air moving across them. The bird calls represent joy and security. Birds only sing when it is safe for them. Thus, our subconscious associate singing birds with safety, thus allowing us to feel secure when returning back into the body at the end of a sound bath. They do not sing when in danger, the chirping is very different.The drum is an earthing instrument and rhythm activates the brain and mind in a way that sets ones consciousness back into the conscious mind." After hearing tranquil and soothing sounds for two hours, I felt entirely free. Free from the anxiety built up in my chest for my week ahead. It was a Sunday evening, which is usually a time I experience major stress and worry leading up to my busy workweek. This experience allowed me to let it all go. I posted about my sound bath on my Instagram story, but I chose not to go on social media for the rest of the night. I felt focused and didn't want to be immediately distracted by outside influences that could possibly take me out of my peaceful state. I told my mom that I'm deciding to gift myself with a sound bath experience once a month. I imagine my experience may be different every time, but I'm already craving this calmness again. The lesson I learned is this: If you feel anxious, don't ignore it. Honor yourself with healing activities that prioritizes your peace of mind. I'm going to practice what I preach. Join me.